1 Door 50" Pizza Prep, call 770.925.4858 for shipping quote. 1 Door Mega Salad Prep, call 770.925.4858 for shipping quote. 1 Door Salad Prep, call 770.925.4858 for shipping quote. 2 Door Mega Salad Prep, call 770.925.4858 for shipping quote. 2 Door Salad Prep, call 770.925.4858 for shipping quote. 2 Door Salad Prep, $1815, call 770.925.4858 for shipping quote. 3 Door 92" Pizza Prep, call 770.925.4858 for shipping quote. 3 Door Mega Salad Prep, call 770.925.4858 for shipping quote. 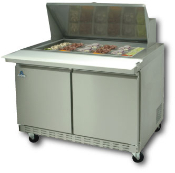 Delfield Four Foor Refrigerated Chef Base. Tested at 34 dgree, works great. Delfiled Sandwich preparation Table. D4032N. Magatop . Holds 12 pans . Works great 34 degrees. 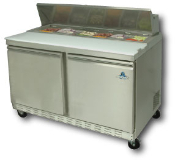 Kairak 48 inch refrigerated chef base . Tested at 34 degree . 110 volt power , works great . 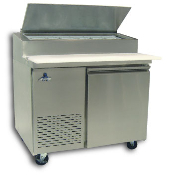 One door mega top sandwich-salad prep unit, 27.5" wide, $1246, call 770.925.4858 for shipping quote. One door pizza prep unit, 44.5" wide One door sandwich-salad prep unit, 27.5" wide Silver king 48 Inch Sandwich prep Unit. single door sandwich prep, made by silver king, mega top, tested at 34 degrees f, 115 volts, used, $650 call 770-925-4858 for shipping quote Three Door Pizza Prep Unit Made by Randell ?92 Inches long works well tested at 36° 115 Volt Single Phase $1500 Call 770-925-4858 Three door pizza prep unit, 93" wide, $3554, call 770.925.4858 for shipping quote. Manufacturer True Refrigeration Also Known As TWT67D4, TRUTWT67D4, 890TWT67D4, TWT-67D-4, TRUE TWT-67D-4 Depth (in) 32.38 Specialty Options Backsplash Voltage 115/60/1 Warranty 3 year parts & labor; 5 year compressor Width (in) 67.25... Two door mega top sandwich-salad prep unit, 48" wide, $1813, call 770.925.4858 for shipping quote. 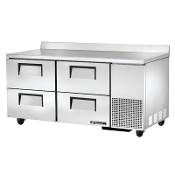 Two door pizza prep unit, 68" wide, $2570, call 770.925.4858 for shipping quote. 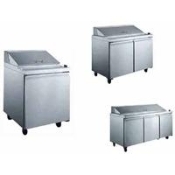 Two door sandwich-salad prep unit, 48" wide $1600 , call 770.925.4858 for shipping quote. 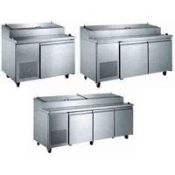 Two door sandwich-salad prep unit, 60" wide, $1767, call 770.925.4858 for shipping quote.